I went into this book thinking that it was a slightly paranormal story about two teens who have some sort of psychic abilities--which was more than enough to intrigue me--but I was so pleasantly surprised when the story revealed and offered so much more! Intangible is filled with several different classes of supernatural individuals, all of which I love. I devoured this book rather quickly since there never seemed to be a shortage of excitement and new information regarding the vast array of characters within the plot. 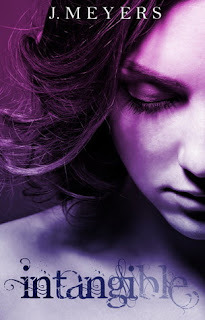 J. Meyers is an excellent writer and she's got me completely addicted and dedicated to the characters within this book. Luke and Sera are the main focus and main characters of this well-crafted novel. They are twins with some seriously gifted and wonderful abilities--she can heal people with her touch and he has visions of the future--and their bond as siblings and twins is incredible. In fact, their loyalty and connection to one another is one of the things I adore most about this book. It's completely believable. They would do anything for eachother, which is a fact that is proven when Luke has a vision about Sera dying and then all hell seems to break loose soon after. In the midst of trying to save Sera's life the twins face heartbreak, love and a new knowledge of a world separate from everything they've ever known--one where they may be destined to play a huge role. Intangible is told through several alternating perspectives (although the majority of the time it's Sera and Luke's), which is something that is hard to pull off, but it was executed so flawlessly in this case. I liked the variety that came from this and it made me giddy to be aware of information before some of the other characters were made privy to it. Speaking of other characters, I'd like to make it clear how much I thoroughly enjoyed all of them! I'm so smitten with Jonas; he has such an edge of power and mystery which is appealing in itself, but when he was around Sera and she brought out the humanity and the protectiveness in him, it made me melt! I'm totally team Jonas! Plus, how can you not like a tall, dark and handsome guy? Then there's Fey, Sera and Luke's best friend, who is capable of so much it will blow your mind. Even Lilith, the crazy/evil villain has a certain allure that made me appreciate her character. There was also Marc, the new kid in town. Reading things from his point of view at times always left me feeling something different every time, especially when it involved Sera. I felt bad for him one minute and wanted to punch his lights out the next. There is so much going on in this book but the author presents and explains it all without it being overwhelming. The ending was just plain fantastic and I'm pretty sure I finished reading the last pages with wide eyes and an open mouth. I'm assuming and I'm desperately hoping that there is going to be a second book, because I honestly didn't want this one to end. I'm in awe at all of the possibilities surrounding the future of Luke, Sera and their allies!